Satliva Red Raspberry Face Cream is nature's superfood! Red raspberry seed oil can shield against UVA-induced damage, making it a perfect choice for the harsh Indian summer. It is a luxurious and unique cream, which offers moisturising, anti-inflammatory and antioxidant benefits for your skin. Red Raspberry seed oil has anti-ageing benefits of improving skin elasticity, while it helps fade the appearance of wrinkles. Geranium essential oil was used extensively by ancient Egyptians for promoting beautiful and radiant skin. It has astringent properties, helps fade scars gradually, is a natural cleanser, ensures toned skin, corrects skin discoloration, reduces acne, and results in glowing skin. About the brand: Satliva was made on a promise that nature is the best nurture. All Satliva products are made using the Indian Himalayan hemp seed oil, which is known for its superior natural goodness and is gentle on the skin. All the raw materials used in Satliva products are sourced from nature and are completely organic and chemical free. The brand has come up with an exclusive and very limited range of organic products for hair, face and body. 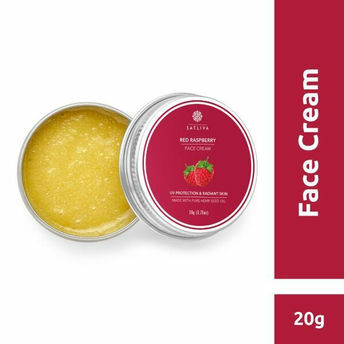 Alternatively, you can also find many more products from the Satliva Red Raspberry Face Cream range.